Hadley Rille on the moon, a long meandering channel, spans some 125 kilometers (75 miles). The surface of the moon is replete with long channels or grooves that continue to create unsolved puzzles and contradictions for geologists. Every traditional theory, when tested against the photographic evidence, has failed. It has now been more than thirty years since the Apollo missions produced voluminous and compelling images of the lunar surface, and it is clear that theory has not kept pace with the unanswered questions. To make our point, we have emphasized the most prominent lunar features, sufficiently documented photographically to place certain details beyond doubt. We considered the most famous lunar crater Tycho. We considered the moon’s most prominent crater, Aristarchus. We also looked at the spectacular Schroeter’s Valley, a “sinuous rille” with many lesser counterparts lying on the lunar maria. Another channel that gained much attention during the Apollo missions is Hadley Rille (pictured above), explored by the Apollo 15 astronauts in 1971. The channel winds across some 125 kilometers (75 miles) of lunar maria. It is almost 400 meters deep (1300 feet, or one quarter mile) in places, and almost 1500 meters (one mile) wide at its widest point. Planetary scientists often say that it was formed by molten lava, and they draw comparisons to lava channels in Hawaii. But the differences between the two are so profound as to render such comparisons meaningless. Many have suggested that Hadley is a “collapsed lava tube”, something much different from an empty surface channel of lava. As flowing lava cools, it will begin to develop a crust, and eventually a stationary “roof” may form over it. A lava tube has the advantage that it enables lava to retain its heat as it flows underground, thereby covering greater distance and collecting less debris from surface cooling. The flowing lava can produce relatively continuous and smooth walls, while a surface channel of lava, because it is continually creating its own obstructions by cooling, with subsequent overflow, will typically meander chaotically across its own debris field. Hadley does not show this appearance at all. (Compare the lava rivers here and here. On Earth we know that the collapse of lava tube roofs is not uncommon, and the area collapsed will be a rubble-filled depression. When the European Space Agency’s Smart 1 spacecraft took an image of Hadley, the popular science website Universe Today reported that Hadley is “probably a collapsed lava tube”. But no lava tube on Earth comes close to such dimensions, and that is only the beginning of the problem. The rubble left from a collapsed lava roof is impossible to miss. And we’ve seen enough of Hadley in high resolution to categorically exclude the lava tube interpretation. As shown by the close-up of a section of Hadley above (right), there is no rubble, no collapsed roof. Hadley is an empty, sharply-cut channel. Whatever once lay within the cavernous depths of Hadley is no longer there. In recent years some theorists have drifted back toward the idea of flowing rivers of lava on the lunar surface. But rivers of lava do not produce a narrow secondary rille constituted from a stream of craters along the length of the larger rille (e.g., Schroeter’s Valley). Over comparatively short distances and times, rivers of lava produce obstructing cooled material and overflow their banks to produce layers of oozing material that freezes in place and whose source is obvious. They repeatedly change course, and undercut the surface along the walls of new pathways, leaving in their wake a vivid display of their erratic behavior. (See pictures noted above). 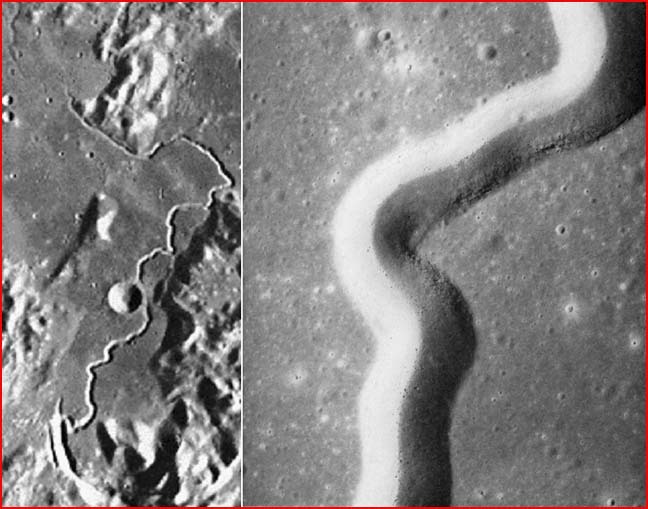 Hadley reveals no such behavior, retaining consistent width over great distances, with parallel sides, while lava rivers show just the reverse. Hadley reveals no explicit overflow or outflow. It is just an empty channel that, enigmatically, grows more narrow as it meanders across a relatively flat valley floor. One explanation of Hadley and other lunar rilles has yet to be considered by planetary scientists. It is the one explanation that does not produce contradictions, or conflict in any way with what we see on the moon. Engineer Ralph Juergens, who investigated a new approach to sinuous rilles, suggested in 1974 that they are the effects of “electrical discharge”. Juergens’ work, in turn, helped to inspire the lifelong explorations of today’s leading electrical theorist, Wallace Thornhill, who has taken the investigation into new areas of research opened up by more recent explorations of our planetary neighbors. 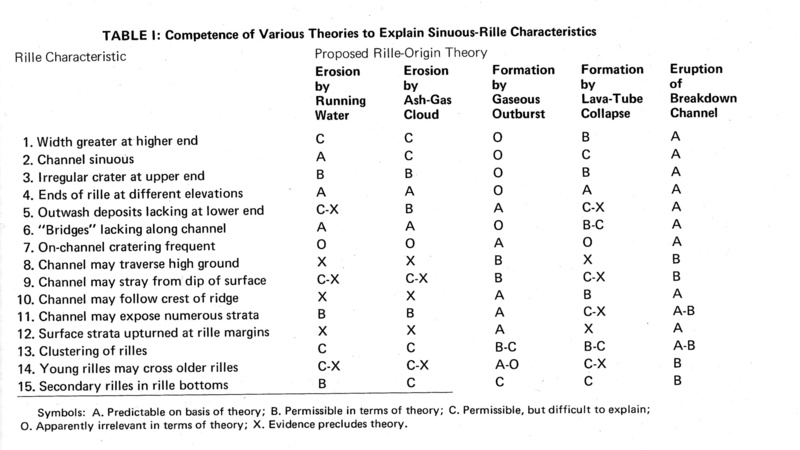 Juergens undertook a dispassionate and meticulous comparison of explanations offered for sinuous rilles. He identified the logical tests and found that prior theories discussed by planetary scientists failed. And most failed on grounds that rationally exclude the proposed explanation. (We have placed Juergens comparative chart here. Juergens knew that an electric discharge of the magnitude implied would require an approaching charged body—and not a just a small rock but another planet or moon. “The electric field between anode and cathode [positively and negatively charged bodies] must build to an intensity great enough to "pull" electrons from the cathode by sheer force, … tearing electrons from non-conducting lunar crustal materials and in numbers sufficient to trigger an interplanetary discharge”. The events as he envisioned them would begin with an electrical breakdown comparable to that of an exploding capacitor, as electrons begin to dissociate from their atoms to become the vehicles of an ensuing discharge. The breakdown point will be a region of maximum stress, most likely a local prominence. “In a flash, the tiny breakdown point becomes a breakdown path propagating itself outward from the starting point, turning this way and that as the intense field at its tip probes for weaknesses in the rock strata”. Breakdown generates heat and explosively expanding plasma beneath the surface. In much the same manner that a powerful lightning strike can excavate a trench, the breakdown channel “tears hundreds of kilometers across the lunar surface at lightning speed”. Then, as the onrushing electrons reach the local high point the resulting electric surge blasts out a large crater. 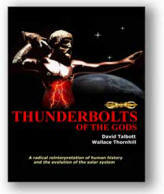 At virtually the same time, more distant electrons along the breakdown path, encountering an electric field stronger than that of the underground path, “blast upward short of the main terminus, creating secondary on-channel craters at numerous points. Juergens hypothesis was based on secure knowledge of the behavior of electric arcs. The fundamental mechanics can and have been verified in the laboratory. (See, for example, the path of the electric arc shown here, with a secondary rille or crater-stream running down the main channel). The hypothesis can also be systematically weighed against the present library of data on the lunar surface, including the profusion of glassy spheres in Hadley Rille, and the anomalous presence of remanent magnetism. And here nothing will prove more compelling than the essential link of rille-producing activity to crater-producing activity—the very consideration that marked the failure of the lava-channel and collapsed-lava-tube hypotheses.